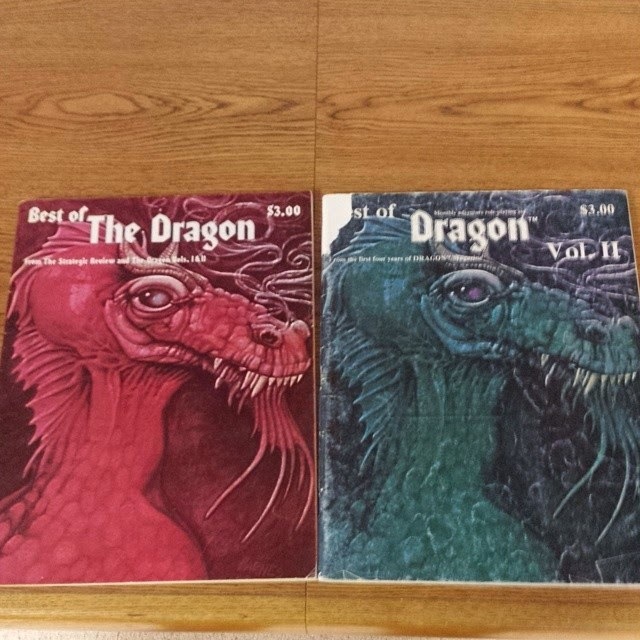 I am very pleased to have replaced my lost Best of The Dragon vol. 1. As you see my Vol. II is a little worse for the wear. I loved these growing up. Even though some of the articles were only a few years old when they got into these "Best of"s they seemed like some lost artifact of a bygone age. Gygax's first details of what has come to be known as the Great Wheel cosmology was and still fascinating reading. Sure I had already seen it a 1000 times in the Player's Handbook but here and in color no less was a rare treat. The famous (or infamous) "How Green was my Mutant" was the article that got me interested in Gamma World more than anything else. Here are also reprints of the first versions of the Illusionist and the Witch. Not to mention a different version of the Bard class and the original version of the Ranger. I am struck with the overall feel of the magazine. It reminds me what I loved the most about old-school gaming and gaming back in the day; the complete DIY feel of everything. Granted there was a lot more undefined areas back then. Still. I love reading this old stuff. I love my Dragon magazine CD-Rom set, but holding on to the actual old mags is really nice. Yeah. Volume 1 is great, it's the one I hung onto through a 20+(?) year D&D drought. Actually #2 seems readily available at a good price. Yeah. But this is my vol. 2 that I got mail order with S3. It has a special place in my heart. interestingly enough this one has more color headers than my original which I swear was mostly black and white. Have them, enjoyed, them, never actually used anything from them that I could recall. Creative juice probably flowed out of them in some way but nothing concrete. Dragon was most that way for me. I found White Dwarf far more useful. Especially the Warhammer stuff. It was so fun and creative it begged to be used even if you had to convert a bit.